Djebel Siroua trek: 6-Day hiking Siroua Massif in the Anti-Atlas, where streams have cut through rocks, gouging out gorges. The ascent of Jbel Siroua giving a fantastic view out over all the high Atlas mountains. We invite you to explore the Safran region and Jbel Siroua, the highest peak in the Anti-Atlas mountains range. Siroua is an area of the extinct volcano and is surrounded by Berber villages. The Siroua is a high, and vast volcanic outcrop made up of ridges and residues of black lava. The region’s snowfall creates ghostly apparitions. With its highest point at 3305m, Djebel Siroua is a world of its own and is a splendid sight for hiking due to its fantastic landscape which has a deserted world of stones and rocks on one side and deeply carved valleys on the other. – Get an opportunity to see the remains of a volcanic eruption. Arrival at either Marrakech or Ouarzazate. We leave Marrakech early and drive towards the Tichka pass in the High Atlas. We’ll have lunch in Aguim and on the road to Taznagt then to Anzel. Overnight at Tammllakout where we’ll meet the team of muleteers. 6 hours drive. After breakfast, we’ll leave Tamllakout and walk down a plateau which boasts of an enthralling view of the mountains. Lunch will be on this plateau which is very close to Tizouad village. We then continue our walk till we arrive at our camp near Ait Tigga village. Overnight in tents and the trek will take an average of 6 hours. In the morning after breakfast, we’ll begin our journey to the village of Ait Ighemour. We will have lunch in the pasture then climb a pass a short way to arrive at the seasonal shepherd’s home in Mgist. Overnight in tents. 5 hours walk. From Azib Mgist, we’ll begin the trek to Azib Iriri. We climb to the Siroua summit which offers impressive views of the Atlas Mountains and the Anti-Atlas. We’ll also have our lunch then descend to the pasture Iriri where we will spend the night in the camp. 7 hours trek. This journey begins after breakfast. The trek will take us to Takshost village. We’ll spend the night in a Berber guest house or camp. It is a 5-hour trek. After breakfast, we’ll continue to Tamazirt village. We will have lunch near the river amidst almond, walnut and eucalyptus trees. We then proceed to Tamllakout where we will stay the last night of our trek in the Berber gite. It is a seven-hour trek. After breakfast in the Berber Gite, we’ll begin the long journey back to Marrakech. 6-hour drive. – The Djebel Siroua trek is available and can be arranged for groups of all sizes. 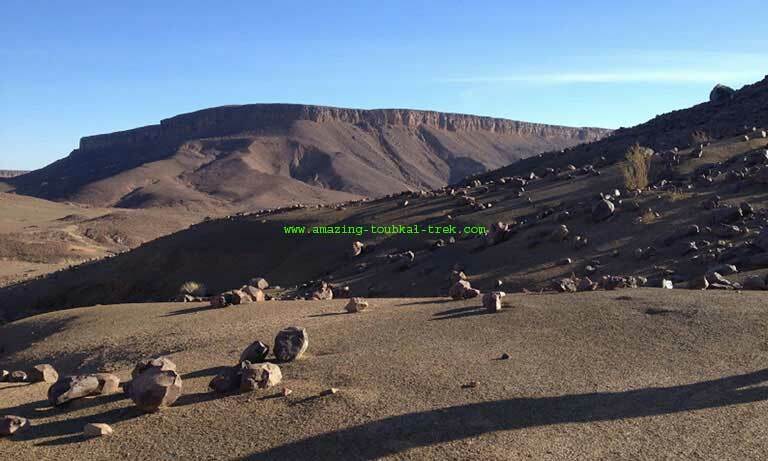 Djebel Siroua trek: Trekking in the Anti-Atlas mountains including the Ascent of Mount Siroua. Hiking Siroua massif, Siroua trek.